Long before your baby utters her first word, she has already started communicating with you, using smiles, looks, movements, and sounds. Children develop at different rates, but they usually are able to do certain things at certain ages. 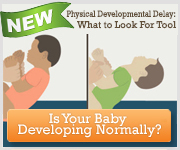 Following are general developmental milestones. Keep in mind that they are only guidelines. If you have any questions about your baby’s development, ask your child’s pediatrician—the sooner the better. Even when there are delays, early intervention can make a significant difference. Take turns “talking” with you—listen and pay attention to you when you speak and then resume babbling when you stop. Say “da-da” to dad and “ma-ma” to mom. Learn about 1 new word per week between 1½ and 2 years.